I am a proud son of the Portland, Oregon area. It was in Portland that I learned how to walk, talk, run, and sleep. It was in Portland that I began the process of education at Ockley Green Elementary School, Jefferson High School and attended several schools – United Theological Seminary and Bible College, American Baptist Seminary of the West, Multnomah School of the Bible, and Golden Gate Theological Seminary – all either based in Portland or Portland-based extensions. I began my secular employment there and my church employment there. I learned how to sing in Portland, I learned how to play piano and organ in Portland. I lived with my parents on Borthwick Avenue and then Rodney Avenue. After I was grown, I lived on Vancouver Avenue, Lombard Street, Skidmore Street, and Taylor Street. I fell in love the first time in Portland and had my heart-broken for the first time in Portland. Most importantly, I gave my life to Jesus Christ in Portland, Baptized in Portland, and was called to preach in Portland. That Portland is now gone. Gentrification has occurred in a manner that I have never seen before. In the 1940s through the 1960s, a migration of African-Americans came to Portland seeking a better life from their roots in the South. They came from Louisiana, Texas, Mississippi, Alabama, Arkansas, and other states to seek employment in a bustling small town that was primarily known for it’s lumber and maritime industries. Most black people in that area settled in an area called Bagley Downs in Vancouver, Washington, which flooded and most blacks settled in the Albina area (then called Albina, Oregon), inner North East Portland, and St. Johns to the far north of the city. Very few African-Americans lives in Northwest, Southwest and East Portland. The community was thriving albeit without the full support of the city for necessary services. When I was a child in the 1960s, I remember that nothing was convenient – stores were not like their other locations. Gas stations were far and few between. Shopping for groceries meant going to Tradewell or Fred Meyer or Safeway. Fred Meyer had two stores – one on Union (now Martin Luther King, Jr. Blvd.) and on Interstate (now Rosa Parks Boulevard). To shop for clothing meant a trip to the Lloyd Center, the nation’s first mall. We had schools that were the pride of our communities – Grant, Jefferson, Roosevelt, and Monroe/Benson for females and males respectively. However, we rarely had our own radio stations. We didn’t have flourishing restaurants or chefs in the communities. There were three main drags – Union Avenue, Vancouver/Williams Avenues and Mississippi Boulevard. If you had a prescription, you went to the Rexall store. If you were a black female and about to give birth, only one doctor delivered most of the black babies – Dr. Richard W. Franklin at Emanuel Hospital (aka the black hospital). I actually worked with Dr. Franklin in my early 20s at Emanuel. Churches were thriving and located almost next door to each other. New Hope Missionary Baptist Church on Gantenbein, Vancouver Avenue First Baptist Church on Vancouver Avenue, Morning Star Missionary Baptist Church on Ivy, St. Mark Missionary Baptist Church on Morris, The Churches of God in Christ on Ainsworth and Stanton, The Catholic Churches on Williams Avenue and Vancouver Avenue, Mt. Olivet on Schuyler, Maranatha, New Song and other churches scattered within a 20 mile radius. Bicycle paths line the streets. Street festivals are common place. Bars have increased some 20 fold in the community. Adult Book Stores, Lottery gaming establishments, stores, clothing stores, and the such have moved in and black people have been forced to relocate to “the numbers” which is a 30 to 60 minute drive from downtown Portland. The old neighborhood was less than 15 minutes. I applaud success but I cannot applaud the displacement of those who built those homes, created the infrastructure and paved the way for those who live in the area today. Housing prices are now astronomical. My parents bought our childhood home on Rodney Avenue for $35,000. Recently the house was up for sale at over $600,000. African-Americans are being redlined and instead of encouraging them to stay, the doors of the suburbs are now open. It has had a whirlwind affect. I feel, personally, that this form of gentrification has long term affect on the psyches of those who no longer have a sense of community. The are locked out economically from homes that for generations have housed the men and women who scrubbed the floors, cleared the boats, built the ships, laid the asphalt. What’s my point? I don’t know if I have one. I’m partially glad to see services that are long overdue and small businesses invading the area. However, the cost may be too high for the livability of African-Americans. Thank God for those who are still trying to bring about a sense of community. The word “diaspora” comes in clear here. Normally, we consider the African Diaspora, when speaking of native-peoples who were removed from their lands. But there has now been a Portland Diaspora. We are challenged across this nation to speak to these levels of racial and class injustices from our pulpits to those who might not see the writings on the wall. Gentrification is one of the most wicked forms of economic oppression this nation has ever produced. My brother, you are not the only one to feel this pain…we all have been victimized by this demon. Yet, i believe the Jews give us a great model to follow. Build, buy, and bank your own is the formula to address this evil form of racism. Be encouraged brother…be encouraged. As you know I grew up in the same neighborhood and I too went to Ockley Green and Jefferson. I noticed this gentrification also. I also don’t like the way many of the Portland Public Schools seem to be struggling with enrollment numbers, while the suburban schools are filled to the hilt and receive the more tax money as a result. It was probably much more noticeable to you since you left and came back to visit. I think part of the process happened when the houses in inner Portland were so expensive, especially in the late 90s up until the housing bubble burst around 2009 or so, north and northeast Portland was still relatively reasonable compared to other “close-in” areas, so people, (I’m assuming from other states), bought up everything for sale in the area. You could get a very nice house for less than in other areas of Portland. The prices were still a little too high for me though, so when I was looking to buy my first house I couldn’t really afford to live in Portland and ended up in the suburbs. Something bothered me about being priced out of my old neighborhood. But I guess I’m just thankful that I was able to buy a house at all. You are absolutely correct. 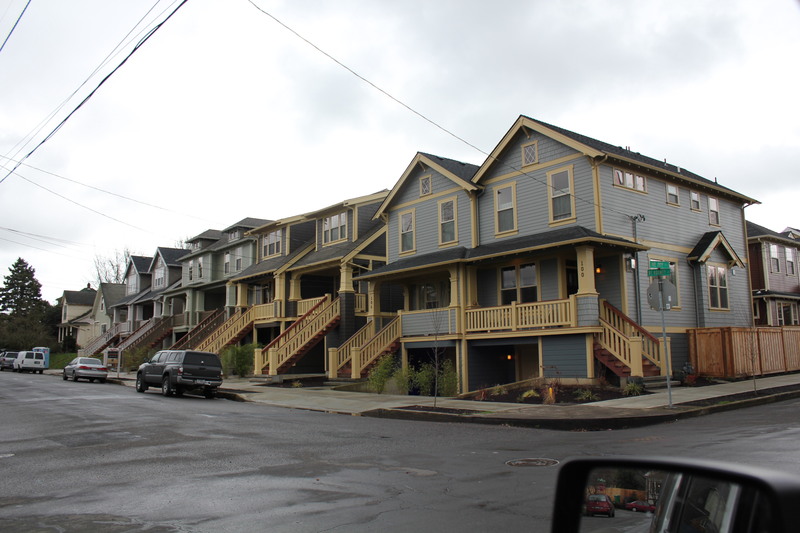 I hadn’t been in Portland in several years and it was horrifying – to see that neighborhoods have had their souls ripped out – and unfortunately an article today in the Portland Tribune is coincidentally talking about it as if it’s not a big thing. But as a “native” it is a big thing. Portlandia this season had an episode about those who grew up in Portland, went away to college, and moved back home, but can’t get housing in their old neighborhoods unless they were moving back home with their parents, because they are priced out of the market. The home that we grew up in on Rodney and Ainsworth was purchased by our parents at $40K and now is valued and was recently sold at almost $700K. It’s insane. I remember the blend of students at Jefferson was split about 50/50 (black/white) and not only did we go to the same school, we lived in the same neighborhoods. I drove past Jefferson and saw Cascade College and was stunned at the loss of buildings and restaurants (sorry, I just can’t eat at the former Little Chapel of the Chimes Mortuary restaurant – just too creepy for me). I’m glad to see the entrepreneurial aspect, but I wonder why it took so long and why didn’t they do this when people of all stratas lived in the neighborhood. I have a plan in the back of my mind to move back to Portland when I retire in 15 years, and I would love to find a place in the old neighborhood – but it’s overpriced and I don’t have the kind of money to invest in a home in that neighborhood. I have no interest in living in the “numbers” – I wasn’t born in that area – I want a home or decent apartment in the area between Freemont and Ainsworth. Good hearing from you.